Bert Middleton is The Gout Killer. Get Gout Pain Relief Here! 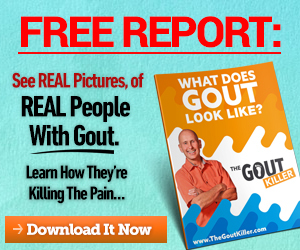 How the story of The Gout Killer brand or business or mission…or whatever you want to call it began, was way back in Santa Fe, New Mexico in about 1996. I was on my way back from a business trip to Texas and over the weekend the pain in my ankle slowly went from annoying to “what did I do, did I twist my ankle?” to moaning and writhing and mass quantities of ibuprofen and bags of ice before landing in the emergency room of St. Vincent’s Hospital. If I’d Had A Gun, I Would Have Shot Myself. This was all before I found out that I only had one kidney. We speculated that I was either born with only one or that I had at some point been abducted by aliens. Nevertheless, having one kidney is no bueno when it comes to dealing with gout. In all my wisdom and some prompting from my new girlfriend (now The Gout Wife) I went off my meds, then all on my own decided that the Atkins Diet was for me…big mistake, HUGE! Fast forward a couple of years and 3 surgeries later for tophi on my fingers and toes, and I was back on allopurinol. 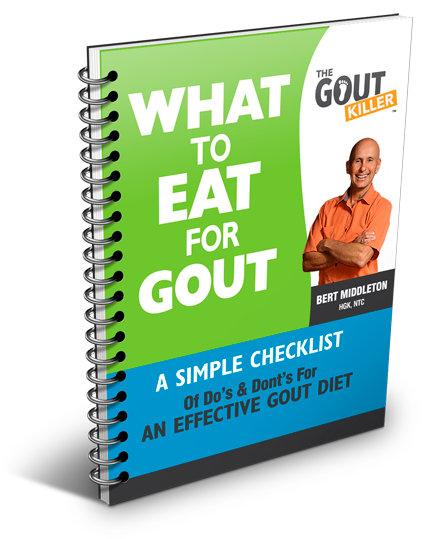 #2) Allopurinol was not the “end all, beat all” that my docs wanted me to believe it was…if I was going to get beyond the painful life of gout, I was going to have to decide once and for all to do it…so I did. 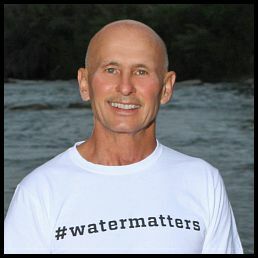 At this point I really need to mention that the “decision” was a carefully developed mental process that tapped into the spiritual essence of who I am deep down…and that is really what lead to my success with overcoming gout. Like so many people with serious and life-threatening health conditions, mustering up the determination, commitment and discipline and meshing with the Power of the Universe; Source, God, Great Spirit, Jesus…whatever you want to call it, that is the starting point. You have to see it, believe it, and achieve it…and know that the Powers That Be will not let you down. Then the next step is to take action…and when the student is ready, the teacher will appear! 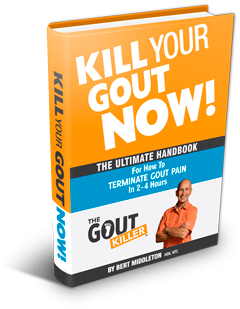 So it was a very odd thing when by a turn of events, I became acquainted with new information, new products, and new opportunities, and set out to become – although I didn’t know it at first – The Gout Killer. Certifications are important in this world today. As far as my credentials for being The Gout Killer go, I consider my first credential or certification to be that I’ve had hundreds of gout attacks…in pretty much every joint in my body. 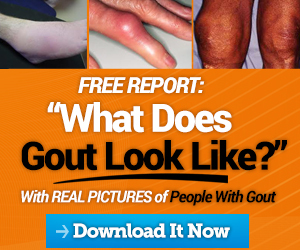 You and I both know how much gout hurts, so I know you know that I know, that I KNOW pain. On top of all that pain and suffering, moaning and groaning, and running The Gout Wife out of the house one night for the misery of god-awful gout attack #117, and an EXORBITANT amount of bleeding-from-the-eyeballs-at-2-in-the-morning research about your favorite subject and mine (gout), and that is the next level of credentials that I can put at the end of my name. There is no one thing by itself that causes gout and there is no one thing by itself that makes it go away. Period. It is best summed up by one word: “Bioindividuality”…which means we are all biochemically different and it is the backbone of the philosophy of Gray Graham and the Nutritional Therapy Association…which is where I got my credentials as a Nutritional Therapy Consultant. I got to a point in my efforts to help others manage gout that required a much more methodically and formalized way to make the journey to better health – the kind of health that doesn’t include getting gout attacks or taking pills. So . . . why I am I here? One simple reason: I Know Your Pain. And I know how to help you get out of your gout pain and stay out of your gout pain. When I got this gout thing all figured out, I very naively thought “I need to tell everybody!” …so being the fairly intelligent person I am, I decided to build a website about what I’ve learned and make what I found out available to others right? Sheeesh…what a rabbit hole to go down. But I did and still do want to make a living by helping other people get out of gout pain and live better, healthier lives because of it. So I’m doing it. I’m here because I know I can help you – just let me know what I can do.